At least six species that have never been seen before on Príncipe Island were identified during recent field surveys undertaken by intrepid local and international botanists. 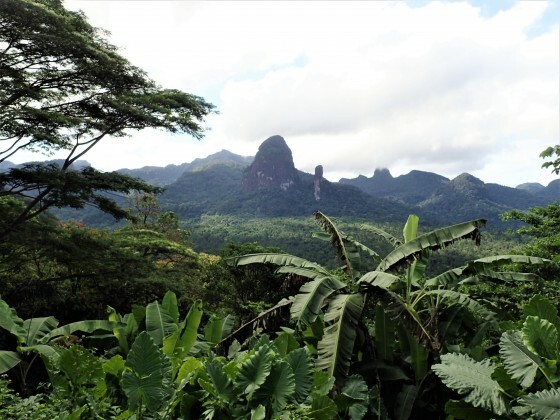 The surveys formed part of the biggest joint plant research effort ever to be undertaken in Príncipe, with 1,200 trees recorded, 110 different species observed, and 450 herbarium samples collected for further investigation. Príncipe Island is nestled into the Gulf of Guinea and forms part of the São Tomé e Príncipe archipelago. The six species that had not previously been seen on Príncipe are from the genera Strephonema, Greenwayodendron, Berlinia, Synsepalum, Manilkara, and Cynometra. The trees may even be entirely new species. These findings were the fruit of a training course conducted in November 2016 in partnership with the Príncipe Trust foundation and with the financial support of Global Trees Campaign. Having identified a knowledge gap regarding Príncipe’s abundance of plant biodiversity, Felipe Spina from Fauna & Flora International, Maria do Ceu Madureira from Coimbra University, Tariq Stevart from Missouri Botanical Garden, and Estevao Soares from São Tomé Botanical Garden led botanical surveys through Príncipe’s dense lowland tropical rainforest. The exploratory treks were underpinned by detailed training sessions that taught local botanists, including staff from the Príncipe Natural Park, the techniques required for current and future field surveys. Training featured short lectures reinforced by long practical sessions, including field expeditions into the heart of Príncipe’s mysterious forests. The sessions taught plant taxonomy, identification, and survey techniques, with a focus on endangered and endemic trees. The provision of GPS and waterproof cameras has also allowed participants to map and photograph surveyed local flora for the first time. 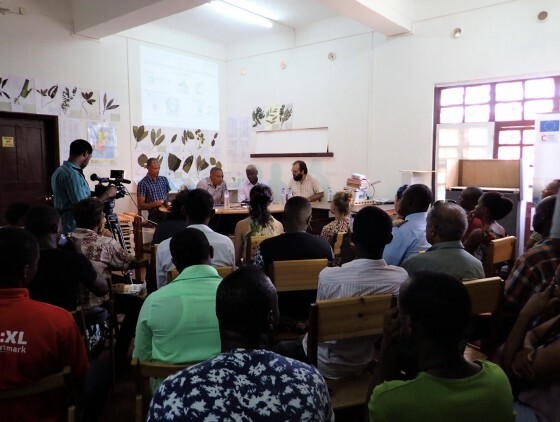 A combination of foreign specialists and local technicians took part in the training, all of whom subsequently confronted the arduous tasks of ironing out inaccuracies in Príncipe plant species identification and updating botanical records. Beyond simply being an adventure into largely uncharted territory, the accurate cataloguing of the island’s plants is imperative for prioritising ways to protect these species. Further to surveying the island’s incredibly diverse forests, the training sessions have offered a rare opportunity for participants to share their local and international botanical knowledge. 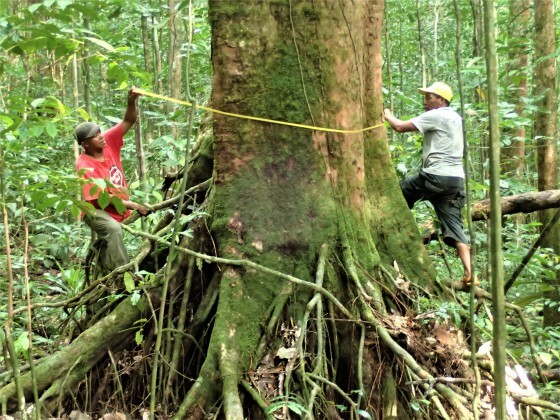 The urgency in botanical training and completing surveys of the local flora stems from the heavy blows that Príncipe’s tropical rainforest has suffered. Much of the unprotected lowland forest is far from pristine and has been disturbed by human activity since colonial times. Forest cover has made way for homes, introduced crops, and illegal trails created by hunters who venture into the forest to trap civet cats, wild pigs, bats, and Mona monkeys. Native tree species are vulnerable to timber harvesting, excessive seed collection, and the spread of invasive species, including oil palm and coconut palms. On top of these immediate threats, climate change will undoubtedly affect the island’s species in ways that we cannot fully predict. There is therefore a pressing need to establish better protection of the island’s plant life, which can only be effectively achieved with a comprehensive understanding of what grows here. This initiative has provided the necessary drive to begin tackling the task. Armed with better equipment and knowledge of the landscape, sampling efforts on Príncipe Island will now continue with a rekindled enthusiasm. Further training, complemented by a second set of field surveys that are scheduled for early 2018, will reinforce last year’s efforts and build an even more robust understanding of what’s at stake if we neglect these species. Hazel was volunteering for a Peruvian NGO before becoming Programme Assistant at Fauna & Flora International. Here she provides support to Global Trees Campaign’s communications and admin. 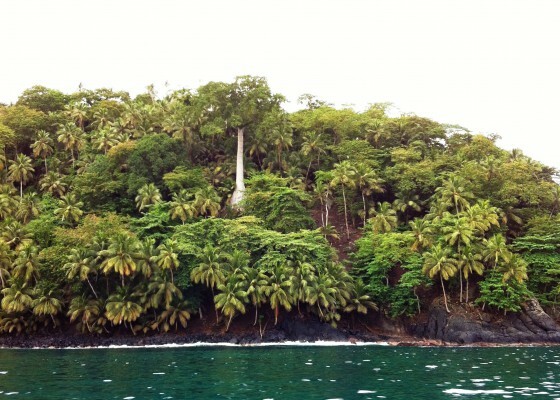 The loneliest palm, Hyophorbe amaricaulis, is one of the rarest trees in the world. Only one wild individual remains on the island of Mauritius.